While American national security policy has grown more interventionist since the Cold War, Washington has also hoped to shape the world on the cheap. Misled by the stunning success against Iraq in 1991, administrations of both parties have pursued ambitious aims with limited force, committing the country's military frequently yet often hesitantly, with inconsistent justification. These ventures have produced strategic confusion, unplanned entanglements, and indecisive results. This collection of essays by Richard K. Betts, a leading international politics scholar, investigates the use of American force since the end of the Cold War, suggesting guidelines for making it more selective and successful. Betts argues that American force should be used less frequently but more decisively. In twelve detailed, well-written, and insightful chapters, American Force does a masterful job analyzing all of the important issues that have arisen during the conduct of post–World War II United States national security policy. This book is a must-read for policymakers and analysts trying to comprehend the current threats to U.S. security and develop effective and efficient responses to them. In this distillation of a career spent on careful study of America's use of military power, Richard K. Betts provides a good, strong dose of skepticism. A practical man, remarkably free of ideological cant, Betts has mixed a fine antidote to strategic conceits, a healthy and humbling aid to good judgment. Richard K. Betts has long been one of America's smartest, sanest, and most knowledgeable scholars on national security affairs. 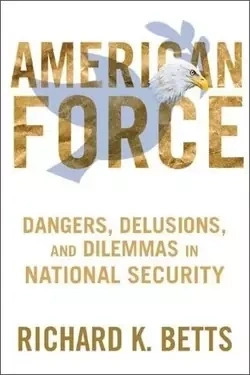 American Force distills his considerable wisdom and offers incisive and clear-eyed analyses of the main security issues that United States leaders now face. If those who aspire to be commander-in-chief (and those who hope to advise him or her) could be required to read one book, this should be it. Highly recommended for aficionados of foreign-policy and national-security issues. Richard K. Betts offers fresh thinking about where America stands in the world in the early twenty-first century and how this nation can move forward most sensibly in the defense of its territory and global interests. In short, this is an outstanding effort. There is no other book quite like it. Richard Betts discusses the end of the Iraq War on the "Brian Lehrer Show"
When the United States became more secure it became more forceful. Since the Cold War ended it has spent far more than any other country or coalition to build armed forces; it has sent forces into combat more frequently than it did in the era of much bigger threats to national security; and it has done so much more often than any other country. The United States has been, quite simply, "the most militarily active state in the world." To many in the mainstream of American politics this is as it should be because the United States has the right and responsibility to lead the world—or push it—in the right direction. To others, more alarmed by the pattern, U.S. behavior has evolved into "permanent war." Some of this belligerence was imposed on the United States by Al Qaeda on September 11, 2001, but the terrorist threat cannot account for the bulk of blood and treasure expended in the use of force over the past two decades. In the first half of the post–Cold War era, until complications in Iraq and Afghanistan, American national security policy was driven not by threats but by opportunities—or rather what an overambitious consensus in the foreign policy elite mistakenly saw as opportunities. Instead of countering immediate dangers, American policy aimed to stabilize the world in order to prevent dangers from arising. There is no evidence, however, that this activism short-circuited more dangers than it generated. And at the same time, American force has been ambivalent, trying to do too much with too little. Policy elites who wanted to make the world right sometimes held back for fear that costly ventures would lack public support. Sometimes they have chosen the worst of both worlds, compromising between all-out effort and doing nothing at all, but with the result of action that is both costly and indecisive. The use of force is the most extreme instrument of foreign policy, and it is what preoccupies the planners of national security policy. Americans like to believe that the United States does not resort to force lightly, and that when it does, it does so only defensively. Whatever the motives, or however justified force may be in principle, it is hard to control and exploit effectively in practice. Many who want to use American force for good purposes focus too much on motives, too much on the ends rather than the means. They lack sufficient awareness of how limitations of the means complicate and often derail the ends. As long as the United States plays the role of superpower it is vulnerable to blame whether it promotes democracy or not, because a superpower has to do political and military business with all sorts of regimes. For decades Washington supported the government of Hosni Mubarak in Egypt, then scrambled to repudiate it when popular revolution broke out. Shifting gears to support revolution makes sense when there is hope that it can prove benign, and support for democracy is necessary despite the risks that it will come back to bite. But the United States will be criticized for sins of control even when it does not control, and lack of control doubles the risk when American military forces are entangled in direct efforts to pacify local conflicts. The essays in this book explore these issues and elaborate on skepticism about American force. This should not obscure the reality that force is sometimes used for the right reasons and with satisfactory results. I am a genuine admirer of the American armed forces and their accomplishments and am happy when they are employed by political authorities who know what they are doing. The good news should not be no news, but the good news is not the focus of this book. The underlying argument in the book is not consistent and unequivocal, as it should be were it to offer a powerful theory; hard problems in real life never admit of simple solutions without exception or qualification. But the essays that follow oppose most of the message of officials and analysts who support American efforts to build (either unilaterally or multilaterally) a liberal empire. The main targets are the presidential administrations of Bill Clinton and George W. Bush (Bush II); I am less critical of Bush I, whose team was a bit more prudent, or Barack Obama, who inherited the worst messes he had to confront, and who at least had the good sense to oppose the worst decision since the Vietnam War, the invasion of Iraq. Pundits or scholars on the wrong side of issues in the chapters that follow are most of the prominent neoconservatives, liberal hawks, and fervent multilateralists, many of whom would be outraged to be lumped together, but who for their different reasons have favored the use of armed forces to further expansive rather than just narrow conceptions of security. My arguments are more in tune with those of Andrew Bacevich, Barry Posen, Stephen Walt, Christopher Layne, Eric Nordlinger, Lawrence Korb, and other realist doves, cautious liberals, and paleoconservatives. The essays in this book touch on a variety of issues and cases, but the point of departure is one conviction: a hawkish stance on national security policy made good sense in the Cold War, but winning that war should have made a bigger difference than it did. There should have been a bigger relief from military activism after the epochal global threat to liberal democracy and American interests went away. To put that case in context, the next chapter surveys the background from which the twenty-first-century security environment came and the evolution of American strategy for the use of force that established important habits of mind that lived on after the dangers that caused them. Copyright © 2012 by Columbia University Press. All rights reserved.